Guru Ji says that we can always have the Divine Vision of Almighty God. Waaho! Waaho! is the Bani, the Word, of the Formless Lord. There is no other as great as He. Guru Ji says that when we get into a devotional state (vairag) and fill with desire to see Akal Purukh, then we can see Him through Gurbani. We need only the faith or conviction that Gurbani is Nirankar Himself. Guru Ji says that His Spiritual form (Sirgun) is in Sri Guru Granth Sahib Ji and Divine experience (darshan) is in the Sadh Sangat. Sometimes a highly spiritual soul may be sitting in the Sadh Sangat, in which case we get tuned to his vibrations. When these vibrations of the spiritual soul are on the same wavelength or frequency with our mind, a new spiritual life begins for us. We should do ardaas or benti before Waheguru. Will such love for the Lord (as referred to by Guru Ji in the line above) ever arise in our mind? Let us try to correct ourselves before it is too late. Guru Ji says that Gurbani is above both wisdom and intellect. If we try to understand Gurbani with wisdom and human intelligence, then we will gain nothing. We can only understand Gurbani by faith and conviction. Guru Ji further adds that even if we have an intense desire to meet the Lord, we will still be unable to meet Him. We need a guide. I touch His Feet and offer my prayer to Him. If only I had the great good fortune to meet the Saint. At the conclusion of the Bhavagad Gita, Lord Krishn tells Arjun: If you forget the teachings of the Gita, or forget all the spiritual knowledge you have gained during your whole life, do not become distressful and say where has your knowledge gone or where has your rosary or concentration(Dyan) or meditation gone. Sometimes, we also confess that we are unable to do our Nitnem when required to do so, or fail to get up in the early hours of the morning for Amritvela. Lord Krishn told Arjun never to lose faith in Him and love for Him. Arjun then said there is no need to worry about anything thereafter. Lord Krishn told Arjun that Arjun was His beloved friend and disciple. He advised Arjun not to treasure material wealth such as palaces, etc. He told Arjun that, if by good karmas and by the Grace of God, he should meet a perfect soul, or knower of the essence, or a Brahmgiani, then, by complete surrender before such a soul, the reward would be that he would obtain the way to reach the Almighty God. Lord Krishn also told Arjun that it is extremely difficult to meet a perfect soul and sometimes it may even be impossible. Guru Ji says: if you can meet a perfect soul, a Sant or Brahmgiani (such as Sant Baba Attar Singh Ji, or Sant Baba Nand Singh Ji), who is very rare to find (one in millions,) then such a soul can explain the way, method, theory or formula to meet the Lord. There are four questions in Japji Sahib. Guru Ji says that the whole secret of life is in Japji Sahib. We are going to contemplate two of those questions here. meaning: what offering shall we place before Him so that we may see His Court or we may get an audience with Him. We sometimes feel happy and satisfied with what little we offer to Guru Ji by way of a beautiful rumala. It is a good gesture. Sometimes we place a few dollars before Guru Ji as offering (Beta.) Guru Ji explains that this gesture is only the ABC of Gurmat. This is to say that, for maybe many years, some of us have not progressed beyond the stage of reading our ABCs. In other words, this is only the beginning of the teaching of Gurmat. Meaning: what shall we say by word of mouth, and by hearing which, He may show His love. What are the answers to these two questions? 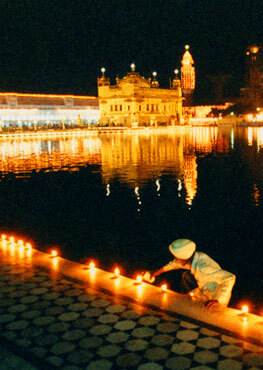 Chant the True Name given by the Guru in the ambrosial hours before dawn and contemplate His Glorious Greatness. 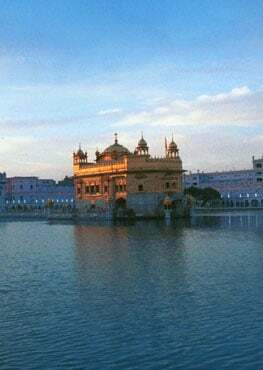 Let us contemplate on this: Only one thing counts, and that is how much Naam Simran, Meditation or Bhagti we did after taking Amrit from the Five Pyarays. Guru Ji says the rest is all ego and vain talk. Sebastian Carranza was an Orthodox Priest. He became Sabbar Singh Khalsa when he became an Amritdhari Sikh.